Who would ever think that such an odd looking fellow would be the protector of such a prized ingredient sought after by top chefs? Harvested from The Channel Islands (Santa Cruz and San Miguel to be exact) a few nautical miles right off the California coast, these cousins of the star fish feed off the prolific seaweed that grows in this warm water region. While on a recent getaway to Santa Barbara, my husband and I took an early morning stroll on the bustling pier. We were intrigued by these beautifully spiny creatures that were being sold and cracked open on the spot by twenty- and thirty-somethings. Ron, the super nice and informative sea urchin peddler, enlightened us about their recent rise to fame in the States. 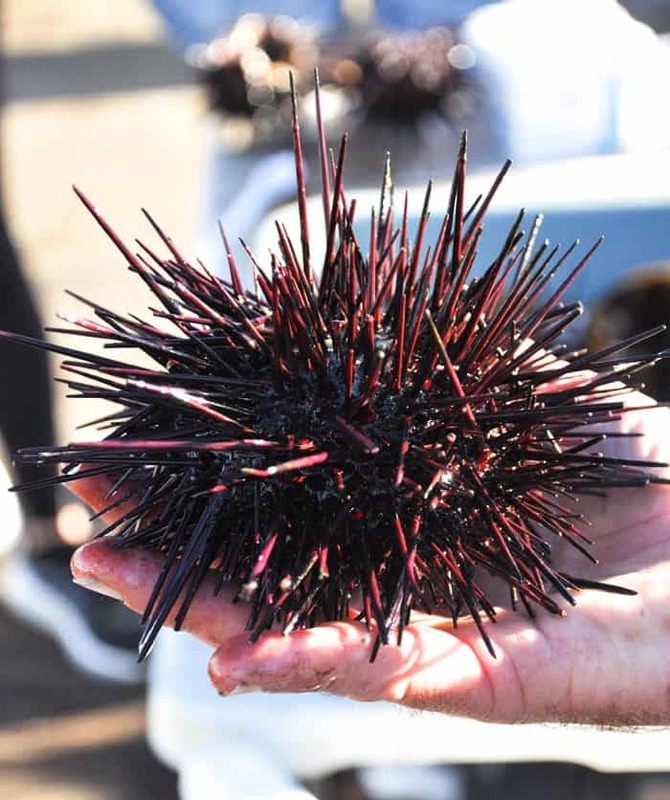 Usually imported straight to Japan, America has recently jumped on the Uni bandwagon with the help of Martha Stewart, Bobby Flay and other distinguished chefs incorporating sea urchin into their recipes. If you’re a little apprehensive, let me help: Uni is considered the Gold of the Sea, much because the hidden treasure within is a honey golden hue with a sweet, buttery taste. Often described as having the texture and flavor of an avocado, uni has the potential to be the next California food craze. And, because they are harvested about an hour’s boat ride from Santa Barbara, the cost is pretty nominal, with the average urchin costing about 5 bucks. A tool specific to cracking open sea urchin is inserted right into the mouth of the urchin. Open up the cavity and expose the California gold that is so sought after. The “roe” or glands are the only goods taken from the urchin. There are four in each urchin and amounts to a few ounces of goodness. Or if you are feeling adventurous, take a stroll along the pier and crack one open!